Ever Thought How Skin Bleaching Can Affect Your Unborn Baby? When a Beauty Technique Is Cancerous! Black people not only experience this stigma from outside of their "racial" group. The bias against dark skin has also been internalised by black people the world over and manifests as colourism within the black community. My research suggests that African-Americans consider light skin as the most ideal personal characteristic one can have. And this internalised bias towards whiteness is not only limited to the US. In my 30 years of studying this subject, I have found it to be prevalent in all places where people of African descent live - including Togo, Senegal, South Africa, Kenya and Nigeria. The stigmatisation of dark skin has led to the popular practice of skin bleaching. After discovering the practice three decades ago, I began to investigate a condition that I have named the "bleaching syndrome". The bleaching syndrome has three components. In the first place, it's psychological, involving the adoption of alien ideals and the rejection of native characteristics. African-American psychologists Kenneth and Mamie Clark conducted a famous "doll study" in the 1940s that showed how black children as young as three come to understand their place in the world as "less than". They reach this conclusion long before they have the ability to articulate race. It's a phenomenon black psychologists refer to as a "colour complex"
This idea that dark skin is "less than" gets reinforced daily on television, in advertisements and through other forms of mass media. Throughout the African continent there have been attempts to discontinue the use of skin bleaches. 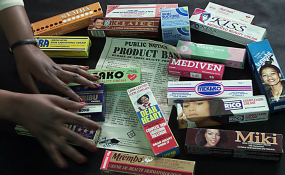 These products are banned in The Gambia, Uganda, Kenya, Cote d'Ivoire and Ghana. Nigeria has not banned bleaching per say but has banned the toxic additives like mercury contained in bleaching creams. While experts in Senegal have called on the government to take similar steps. The "natural hair movement" offers a good example of how we may be able to combat the bleaching syndrome. Natural black hair, afros and dreadlocks have been historically stigmatised - much as dark skin is today - and there was a time when Black people applied all sorts of concoctions to straighten their hair. In fact the first African-American millionaire, Madame C.J. Walker, made her fortune selling hair straightening products to black people. Rather, it was political action that changed black people's ideas about black hair. Stokely Carmichael, Angela Davis, Steve Biko and Patrice Lumumba are among those who rallied against self-hate and spread a message of African pride. Natural hair came to be associated with freedom and justice. Ronald Hall does not work for, consult, own shares in or receive funding from any company or organization that would benefit from this article, and has disclosed no relevant affiliations beyond the academic appointment above.